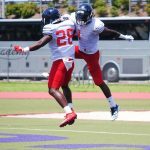 MIAMI – An FAU defense eager to prove that last week’s performance wasn’t a true reflection of its talent dominated the Owls’ offense for much of Saturday’s scrimmage at Moore Park. The defense held the offense out of the end zone for the first half of the scrimmage. 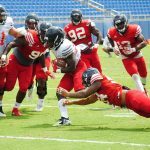 They controlled the line of scrimmage, rattled FAU’s quarterbacks with pressure and confused them with coverages – all outcomes that couldn’t be accomplished during last week’s scrimmage. A week after intercepting only one pass, the defense nabbed three and could have – perhaps should have – added a couple more. “That’s a good thing for us, just touching the ball,” safety Zyon Gilbert said. 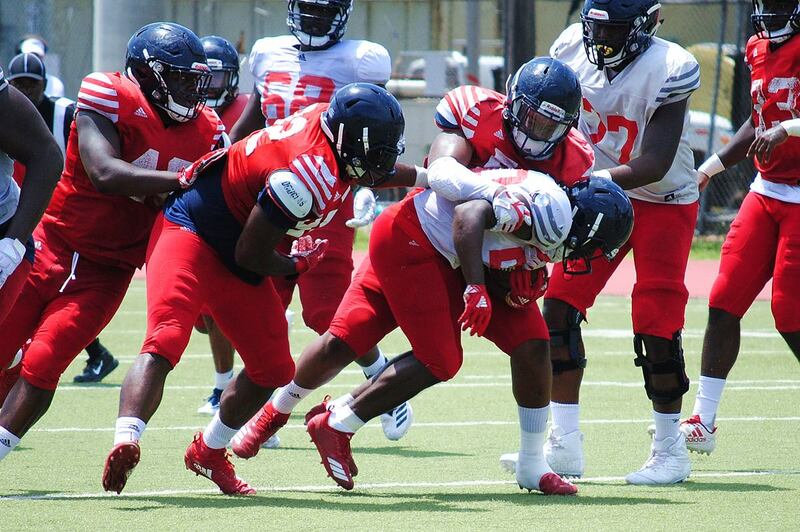 FAU backs found little running room, though Malcolm Davidson likely would have scored on a long ran had the defense been tackling as opposed to wrapping up or tagging ball carriers. FAU’s receivers struggled to get open much of the afternoon, and when they did holding onto passes became an issue. Armani Adams, Chris Tooley and Diashun Moss all grabbed interceptions. For Tooley, the pick marked his second in as many weeks. After more than a half hour of offensive futility, Agner fired down field to wide receiver John Mitchell, who tapped the ball to himself, snatching it away from Tooley for the 40-yard touchdown. Not too long after Agner saw speedy slot receiver Willie Wright draw one-on-one coverage from Gilbert, a clear mismatch, and lofted a 40-yard pass toward the end zone. Tronti’s lone touchdown pass occurred when Jordan Merrill made a better adjustment to an underthrown ball than did corner Malik Vigille – some might argue he pushed off – hauling in the pass at the goal line. Shane Ellis also scored on a 15-yard catch and run from Trent Wessell. The offense did not score a rushing touchdown.